Welcome to Eric Conveys an Emotion. Glad you could make it. The concept here is simple, this is a humor-oriented interactive website. You request an emotion (or reasonable facsimile), and I will try and act it out for you. The frame on the left shows the currently filled emotions. The list in the right frame shows requests that are waiting to be filled. Sure, so some of these may not be emotions per se, we're just having fun here. So what are you waiting for? 04.01.08 ~ Hello, there's an update today! Just kidding suckers, April Fools! Wait, no, how does this holiday work? There is actually a new adventure up today, called The Interview. It stars once again some friends that you know that do a site that rhymes with Homebar Funner. More adventures are on the way. Or *are* they? April... Fools? I'm confused. 07.21.06 ~ Umm... hello? Is this thing on? Dang I gotta update this place. Until then though, if you're going to the San Diego Comicon this weekend, I'll be there, most likely hangin in the Flight booth, #1131, come say hello and buy all their stuff. They're one row down from Penny Arcade and Dumbrella and Billy West(!). See ya there! 12.25.05 ~ Belated Happy Winter Solstice! There has been a great void of updates, which I will conveniently blame on work and my employer. If you want to see more updates, email them and tell them to give me more vacation and donuts! I do hope to update more in 2006 though, and oh yeah, get the request system back up and running. In the meantime, hope you all have a safe and happy holiday, see you next year! 01.29.05 ~ The site is finally partially somewhatly back online(ly)! I won't bore you with the details but the dedicated server and bandwidth that has powered this site for the last several years is no more. I'm currently on the hunt for new hosting (thanks again to Rob at NetDojo for the interim hospitality). Some parts of the site are still offline (requesting, store, forum and guestbook), but the emotions are back. In the meantime, now might be the perfect time for a site refresh/redesign. This site hasn't changed very much in terms of design and functionality over the years, and it really hasn't had to, but it's always something I've been meaning to work on. So this is my short-term to do list: 1) Find new hosting 2) Post the new adventures that I keep talking about but never have time to actually post 3) Redesign entire site, front and back end. I'm not sure which one of those three things will be the most difficult. Oh, and before I forget, thanks to all the people who emailed during the downtime, I know I don't update as often as I used to but it's nice to know people still care about this little site. ... That was so mushy. 10.31.04 ~ Whoa. OK Internet, we have a lot of things to talk about, you and I. I know that I have been kind of distant lately, but baby let me explain. Firstly, I did not move to New York after all. I know you didn't want a long distance relationship. So instead I moved back to the San Francisco Bay Area so we can be closer. I know how you love to hang out and party in Silicon Valley. 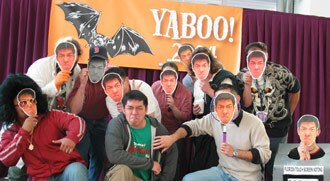 I now work for Yahoo!, you've met Yahoo! before. 5) Am I done talking yet? Sheeeeesh. 08.10.04 ~ Well the Comicon was a blast this year again, it was great to see the sights and meet everyone. EVERYONE! I wasn't asked to autograph a girl's breast this year though, which breaks the streak that dates all the way back to ... 2003. I'm running very short on time right now (and possibly moving to New York City next month), but just wanted to get a tiny update in and give you a tiny morsel of a couple of adventures (see right). Don't worry, you'll get the main course soon. In the meantime, take care of yourself... and each other. 07.18.04 ~ If anyone is planning on going to the San Diego Comicon International this week, be sure to stop by the Flight Anthology booth at booth #1231. Them's some talented artists and you can buy their brand spankin' new first issue there. I'll be sitting in and around that booth when I'm not wandering the convention center trying to find nerds to punch in the face, so come say hello. 05.31.04 ~ Tumultuous! That is what things are like in the world of emotioneric.com. The server went down for about 10 days, but things should be more stable now. And wonder of wonders, there is even an emotion update today. But wait, there's more! 04.13.04 ~ I guess that was kind of a mean April Fool's joke, huh? But like last year's, a lot of people still fell for it. But seriously now, a real update will be happening next month. In May I'll fill you in a little more on what has been going on lately (if you'd like to know). 04.01.04 ~ Updated! New emotions! 12.29.03 ~ WHERE ARE THE UPDATES?!! !111 ... oh wait, it's me. Hope all of you out there in internetland are having happy holidays. I'm holidaying it up, but I'll be back in the '04 ready to ROCK IT DEF LEPPARD STYLE (or whatever music you crazy kids listen to nowadays). 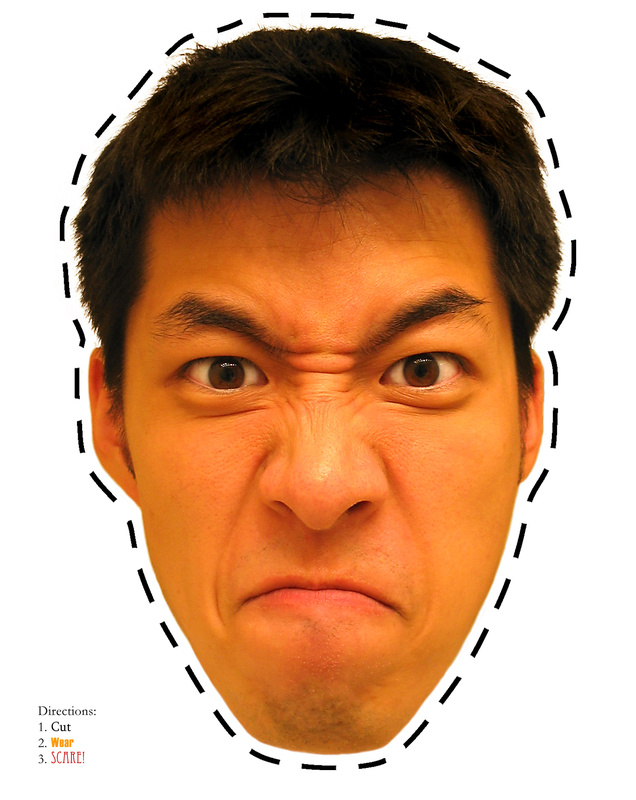 10.30.03 ~ Looking for a last minute Halloween mask? 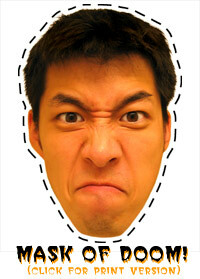 Scare and horrify everyone with this grotesque mask. Just print and Dave Coulier (Cut.It.Out.) and you're ready to go. 10.13.03 ~ The forums are back! 09.22.03 ~ There's a new adventure today, the New Pad. I'm busy working on the new t-shirt order page and getting the forums back up and running, but I don't think you care. All you want are more emotions. You all are animals! Animals I tell you! I have been very busy as of late, I hope you don't think I'm ignoring you. You know you're the only one I really care about. You make my heart all a-pitter-patter inside. I'll be back later next week with a new adventure, and spiffy new t-shirts to order. Miss you. 08.05.03 ~ We have a winnah! Actually we have a few winners. There were alot of good entries in the cartoon/anime Eric contest, but Ryan Schmidt took the cake with his EmoEric rendition. He wins a free t-shirt, and actually his two images are going to be made into t-shirts as well. It's about time for a new t-shirt design. They could be available to order as early as next week. There were actually three entries I was trying to decide between, and I figured I might as well put up one extra shirt to win. I'll leave it up to you to decide who wins. Roll over to the forums to see the two finalists and vote for your favorite one (you must register to vote, this is to make sure the voting is fair). The image with the most votes by next week will win a free t-shirt. You can also view all the contest entries in the forum. And for the request contest, out of the 5,817 requests submitted in July, the person randomly picked to win a free t-shirt is ... Colin from Marblehead, Massachusetts! Well that was anti-climatic. I tried to make it more exciting by adding an exclamation mark. Did you see? 07.29.03 ~ How now brown cow? That doesn't have anything to do with any current news, but it's fun to say. There are some more new emotions for your eyeballs to see this week. Also, the T-shirt contest (see 07.08.03 entry below) is winding down, and I've decided to keep it open for a few extra days, until next Monday. I'll announce the winners next Tuesday for the cartoon and random request contests. Are you excited yet? I definitely know that I maybe am. See ya next week! 07.22.03 ~ The San Diego Comic-con this past weekend was a ridiculous amount of fun. I got to meet and see so many great people. I even got to chat briefly with the Matt Groening. I'll definitely be going back again next year. As I've mentioned before, July 25th will be the 5th anniversary for "Eric Conveys an Emotion". When I first started it back then, I only intended it to be something fun to pass the time, for me and a few friends who knew about it. I think it still serves that purpose, just on a much larger scale now. I tend to downplay the importance of this site, but truthfully, my life would probably be much different if it never existed. It was because of this site that I got my first job out of college and moved to California and met all the great people and friends I've met out here. And in these five years I've had literally thousands of people email or come up to me, thanking me for cheering them up when they were down, getting them laughing "to the point of tears", or just generally making them happy. By selling t-shirts and donating all the proceeds to children's hospitals, I've been able to help kids out in a way that I probably would not have been able to before. I've received emails from English teachers in foreign countries who use it as a teaching tool, from parents and teachers who use it to aid children with autism and Asperger Syndrome, and a couple years ago I got a moving email from someone who was contemplating suicide, but (long story short) was sent the link here, and was grounded. The subject line of that email was "Thank you for saving my life". Make no mistake, I have no delusions of grandeur, I'm acutely aware that in the bigger scheme of things, I'm generally nobody, and this is just a small, goofy website on the Internet. But I think for that, I'm glad. 07.15.03 ~ Y'know, I don't think I have that much to say this week, but that shouldn't stop you from checking out this week's adventure update, The Slot Machine, taken in good old Sin City. The place is so evil and fun all at the same time. The art contest is still going on through July (see the entry below for details), and the San Diego Comic-con is this weekend. I'm hoping to meet Matt Groening, Kevin Smith, Joss Whedon, the Adult Swim guys, a bunch of webcomic people, and tons more people of whom I am a fan. Tons! If you're going and want to say hello, check out this thread in the forum. 07.08.03 ~ New week = new emotions. Is fun, no? This July is somewhat significant sentimentally (say that three times fast) because on the 25th, this site will have been around for five years. My birthday is a few days after, and if the latest emotions are any indication, I have already begun my slow and steady descent into madness. I figure a five year anniversary is as good a time as any to celebrate and have a contest, I don't think I've had one since the good old cube contest. There will be two ways to win. The first way is for all you artists out there. I get a lot of requests for "Cartoon Eric" or "Anime Eric", so send in your rendition of one of those and the one I like the most wins. I'll also post them in the forum so everyone else can judge for themselves. The second way to win is just to submit a request. I'll randomly choose one name out of the requests submitted for this month to be the winner (make sure you have a valid email so I can let you know if you win). So what do you win? The prize for each of these is ... ::drumroll:: ... the respect and admiration of the internet community! No just kidding. The prize is an Intrigue T-shirt of your choice. You can choose from a baby doll or regular T-shirt, and if your size is available, you can even choose from a small number of fancy colored ones that I had made up for occasions such as these. The contest(s) will run until the end of this July, tell your friends. Happy contesting! 07.01.03 ~ Welcome to the first week of July Updatey Madness! Y'know, when I said I would update every Tuesday in July, I didn't realize there were five Tuesdays this month. Oh well, I guess that just means more emotions and adventures. This week also brings Fourth of July celebrations in America, where it's your patriotic duty to barbecue and watch fireworks. You don't want to be a Communist, do you? Because if I see you suspiciously not BBQing with your eyes looking groundward, I will report you to McCarthy so fast it will make your commie head spin. Later this month, July 17-20, I'll be at the San Diego Comic-con International. Yes, I am a nerd. If you're going and you want to meet up or grab a shirt or something, leave a note in the forum and maybe we can all figure out a day and time. This will be my first time at this convention, I think it will be fun.